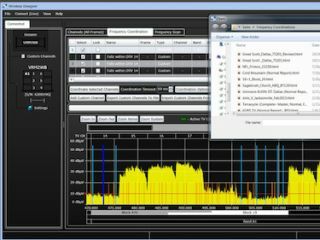 Lectrosonics has released the latest version of its Wireless Designer Software. Along with minor enhancements and workflow streamlining, the latest version now allows for importing of frequency lists and also the creation of custom frequencies. This allows for the software to include other wireless systems in the overall frequency coordination. HTML files from IAS (Intermod Analysis System) software from Professional Wireless Systems, with detailed frequency coordination information, can be directly imported. Wireless Designer is a software package developed to enhance setup and operation of Lectrosonics' studio and rack receiver systems including Venue, Venue 2, and DR. The software provides an overall view of Lectrosonics' wireless systems, including all receiver mainframes which are connected. A summary of each channel is displayed with real-time indications for essential levels and settings on each installed module within the system. With multiple receivers, the main display window can be scaled and zoomed for the desired viewing, and several color themes are provided. The Wireless Designer software includes a spectrum scanner and coordination package for fast setup. The receiver can be tuned across the available bands (via the modules) and presented in a graphic display. The data from the scan, along with any custom frequency data (including imported lists), can then be incorporated into the frequency calculations for an accurate channel coordination. All the new version requires is a PC or Mac running Silverlight (a free download from Microsoft) and a connection via ethernet, USB, or RS-232.